Based on the lectures of Nishi, I would not be surprised if Intent 2 would become the (main?) OS of the upcoming one-chip-MSX. In this newspost you can find a small summary of the capabilities of Intent 2, but you can also read the whitepaper on the Tao website. If the one-chip-MSX came with Intent running MSXPLAYer... would it be good enough to you?. To me it sounds like an interesting step to take. With intent all basic-functioality including a web-browser, C++ and JAVA compilers, 2D, 3D and video streaming capabilities and a nice audio system are already there. With the MSXPLAYer a huge database of MSX Software is added to the products that can be run on the device @ launch. And a system sure needs a lot of launch titles these days, in order to become succesful. So.. if the one chip MSX could boot in Intent-mode and some sort of 'single tasking direct hardware mode' (for games etc.)... I think we are heading to a very nice system indeed. What are your thoughts on this one? When I read all these things and keep the developments until now in mind, things starts to shape up indeed. And I'm all for it!! Will it come with MSX Basic++ too ? It makes a lot of sense to emulate MSX in software instead of hardware where possible. But then the question becomes: what is so special about this machine? Why not buy any other PDA / console / mini PC that is capable of emulating MSX? And why choose MSX Player as the emulator, instead of an emulator with more features or higher accuracy? So it's a multi-purpose computing device, with the ability to run MSX software. That ability is not unique, but having it pre-installed is more convenient for users. I don't think the name one-chip-MSX is appropriate though. If you need to ask that, you need to read some older threads about the subject. well.. this thread isn't about to MSXPLAYer or not to MSXPLAYer, it's about to Intent or not to Intent. Please read the whitepapers and tell me... Is this an OS as you want to see it? Are you impressed? Or is this far from the ideas you have about a possible new MSX computer? The white paper looks good, but it was ofcourse made to sell something. I haven't used Intent myself, but I heard and read reactions from people and they seemed to like it. A virtual machine approach gives you flexibility in hardware, while keeping software compatible. With modern VM technologies, it is not that much slower than native code. In fact, in some cases VMs can be faster than native code because they can optimize dynamically rather than statically. Intent's VM apparently is more like a virtual CPU than Java's VM, which is a stack machine. But I don't know enough about VM technology to say what the advantages of each approach are. One potential risk is that Intent is a product, not a standard. So Intent's fate as an OS/middleware is tied to Tao's success as a company. The BeOS was technically superior in terms of real-time behaviour, multiprocessing, resource requirements and easy to use GUI to most operating systems at the time. However, Be as a company wasn't making enough money and BeOS development was halted because of that. The rights were bought by another company since, but BeOS has lost its technical lead over other OSes. Another risk of using a product instead of a standard as your infrastructure, is when it does become a success. If you build your stuff on top of infrastructure owned by one company, you're at their mercy. For example, Microsoft is exploiting their monopoly position. But I think very few companies could resist taking advantage of a dominant position (Google is doing fine so far, I hope they keep it up). Anyway, it seems that computing is getting interesting again. In the 90's, the PC dominated, powerful and flexible, but also unappealing machines. Now and in the next few years, there will be a lot of different computer-like devices. Mobile phones, PDAs and portable gaming are merging; consoles, DVD players and video recorders are as well. PCs are becoming smaller, cheaper, quieter and better looking. And data can be exchanged between all these devices using flash memory, USB or wireless. MSX machines were small, quiet, good-looking (most models). But most important, they encouraged creative use, such as writing programs, creating graphics and music and putting all that together. So if any platform wants to replace MSX, it should allow those kind of creative expressions by the users. It should not be a passive system where you buy something and use it like the manufacturer intended, but it should allow users to easily create content themselves. Some recent developments are encouraging users to be creative, for example game mods, ranging from user-made levels to almost completely new user-made games on an existing engine. Other developments are discouraging it, for example restrictive copy protection mechanisms, for example if an amateur developer makes a game for PS2 or XBox, people would have to chip their box to be able to play it. Also the SDKs and hardware docs for those systems are closed. I hope the open and creative directions will win. That would certainly be the best for end users, but probably better for the companies as well, in the long run. Intent's fate as an OS/middleware is tied to Tao's success as a company. Anyway, it seems that computing is getting interesting again. So it is! I think the days of just looking at specifications are finally over. The time has come for people to start wondering "Well, that's nice, but can I do with it what I want to do with it?" or with games "Impressive, but do I also like playing it?" So if any platform wants to replace MSX, it should allow those kind of creative expressions by the users. It should not be a passive system where you buy something and use it like the manufacturer intended, but it should allow users to easily create content themselves. To me this means there should be a new, modern-world version of BASIC to start with. Open documentation and a relatively simple system structure are, too. It's quite easy to understand an MSX computer. It's quite hard to understand PCs. There are other Basic that would be much more appropriate. This weekend I got to play with Blitz Basic 3D edition, it's really a neat tool. It has all the advantages of Basic(simplicity, quick results), yet it's very powerfull and makes programming advanced games in 2D or 3D very simple. It even has network functions if you want to create multiplayer games. 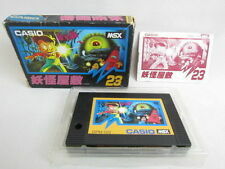 This is the kind of things I'd like to see coming with the new MSX. I think Python would be a good candidate for a hobby programming language. It has many of the properties that make BASIC easily accesible to new users: no need to declare variables, simple but powerful "print" statement, simple programs are only a couple of lines (no need to define a "main" procedure; Hello World is a one-liner), string manipulation is really easy, no need for compilation, interactive shell for trying out things, automatic memory management. But although the base language is simple, Python has a lot of power as well: you can use objects, exceptions, documentation comments and even higher-order functions. But those features do not get in your way if you don't want to use them. Also very important is that Python is just fun to program in. I'm not sure why, but I think it's because you can accomplish a lot with only a bit of code. So you don't have to put in a lot of effort to get results. If you like programming, you should give it a try! You can freely download the interpreter and documentation from python.org.